Friday Night in Santa Ana! 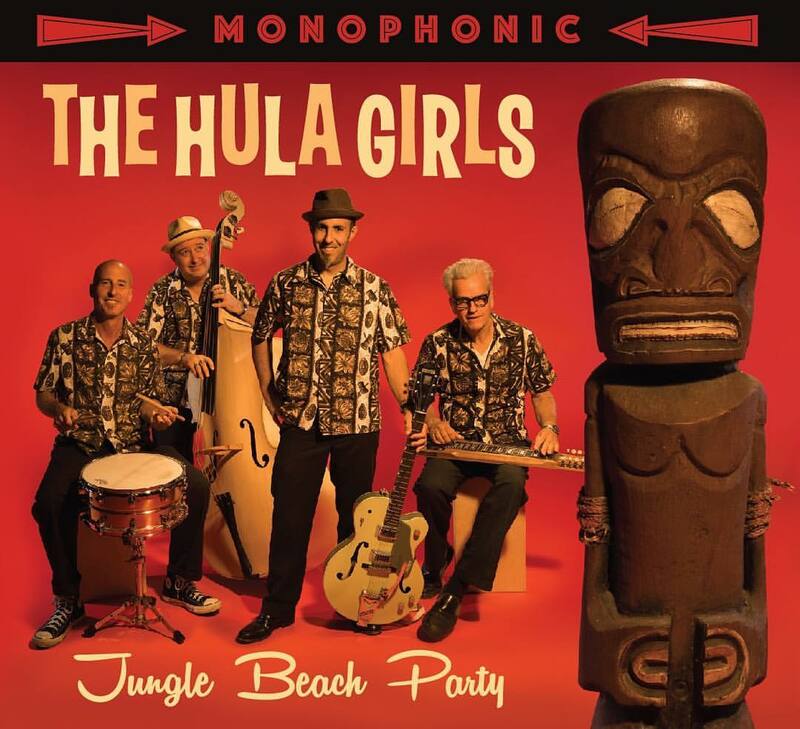 Join The Hula Girls, this Friday at Underground DTSA, for one of the most eclectic lineups that we have ever been included on! A Johnny Cash tribute, psychobilly with Three Bad Jacks and Sandbox Bullies, and punk rock with Todd Harper's Heatbreak Express... AND The Hula Girls! 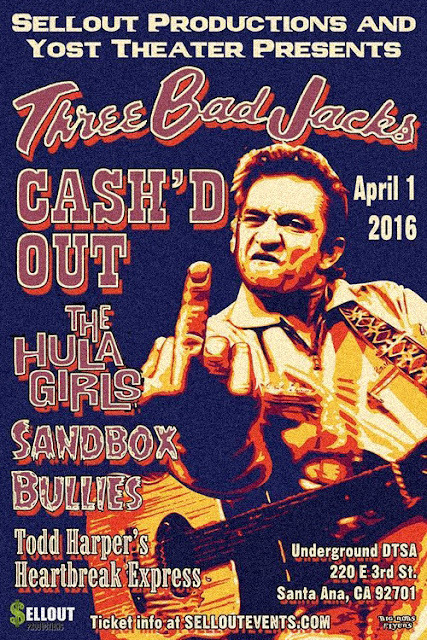 All of the bands are great and we are certainly looking forward to it! 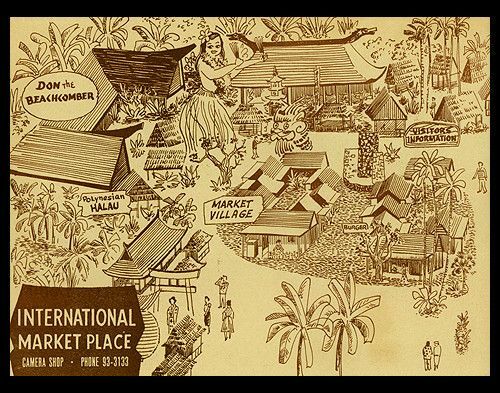 The International Market Place (and the Tiki Market Place)! 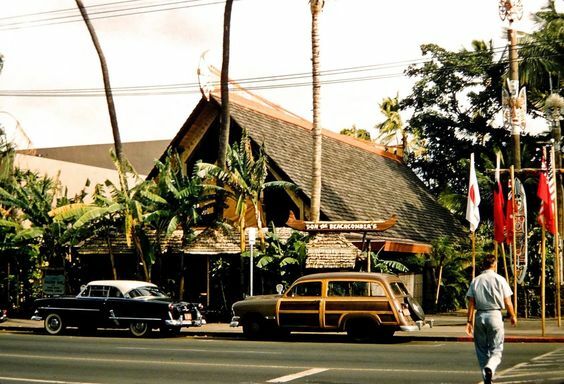 Photo from facebook's "Vintage Hawaii"
Ernest Raymond Beaumont Gantt, otherwise known as Donn Beach, and more notably as Don the Beachcomber, founded the International Market Place, with the commissioning of the Dagger Bar and Bazaar Buildings in 1956. 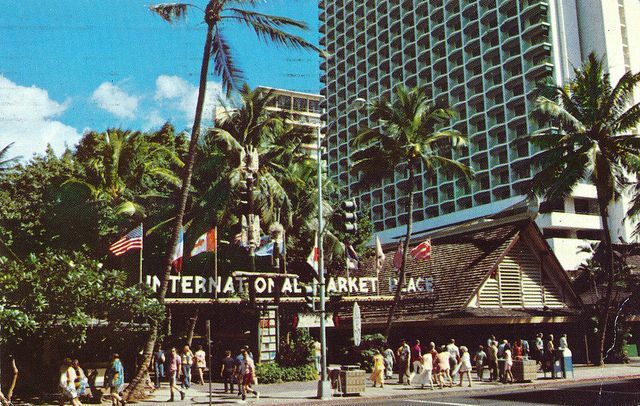 During the 1960′s, other elements of the International Market Place included the Hawaiian Hālau, Japanese Tea House and Esplanade buildings. 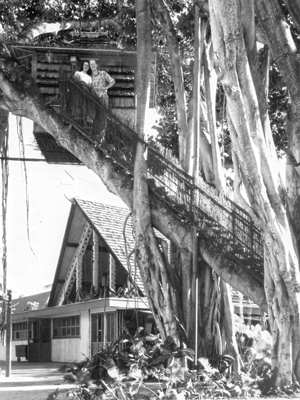 The exceptional banyan tree, planted sometime in the mid-19th century, still remains to this day and was once home to Don's Tree House. Some groundbreaking musicians, including Martin Denny, Les Baxter, and Alfred Apaka, came out of the Market Place. 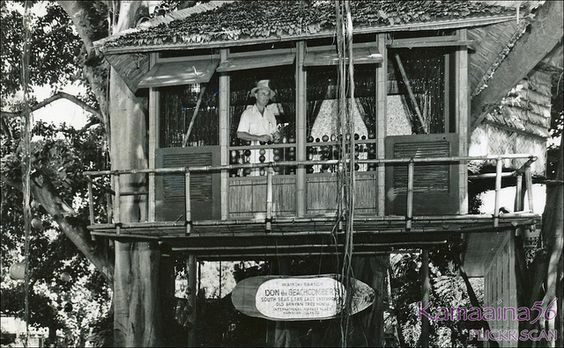 Don Ho got his start there as well, before his show became too popular and had to move to the Hilton Hawaiian Village Dome. 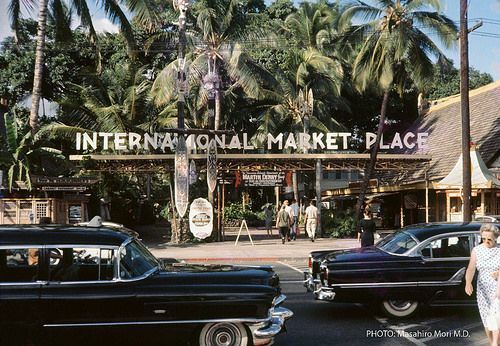 Let's take a look at the historic and venerable International Market Place. The concept was really pretty cool. 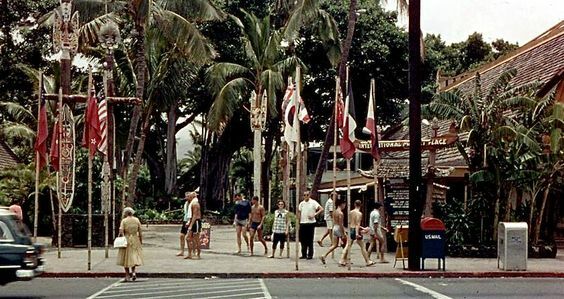 An outdoor 'tour of the Pacific,' with tourists strolling through Polynesian, Japanese, Chinese, Filipino and East Indian dwellings. They could sample ethnic foods, watch tribal dances, or shop for native crafts. 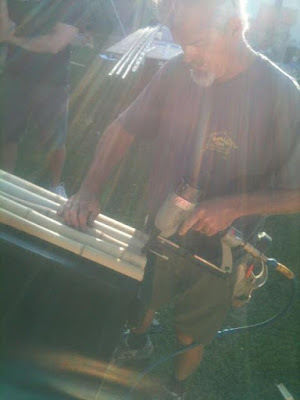 Mick Brownlee, a graduate from the California College of Arts and Crafts in Oakland, CA and a three year resident of Hawaii, was hired to carve and decorate the grounds. I always found that funny. 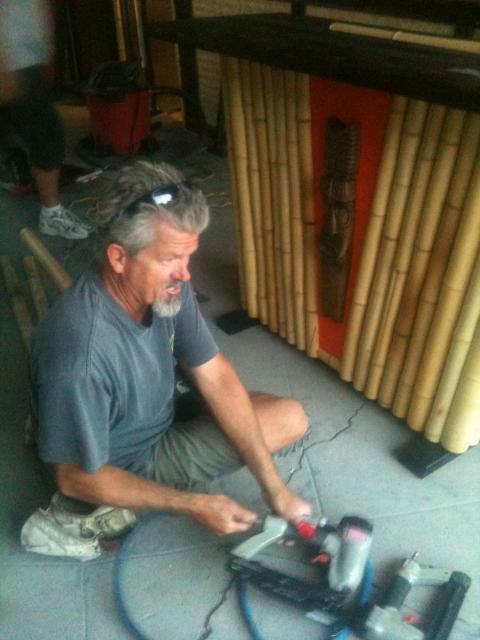 A white guy from Oakland, hired to carve tribal decor in Hawaii. ...And tiki IS just that; it's false Polynesia, the non-Hawaiian's interpretation of the tropics. 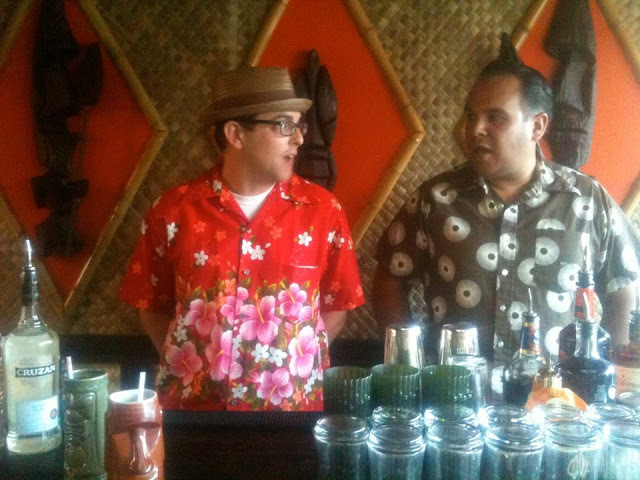 Tiki caters to the tourist not to the indigenous. 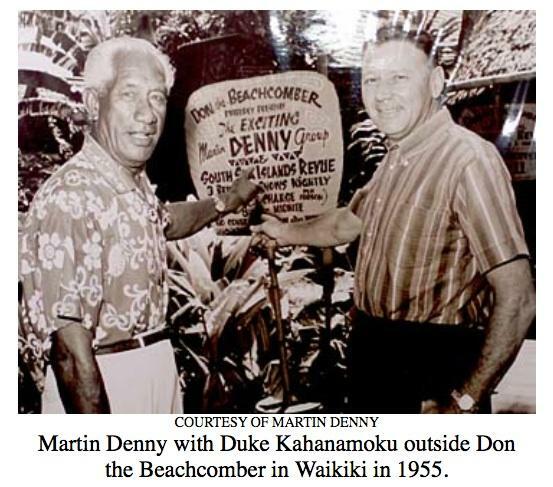 It took Donn Beach, coming to the Oahu around 1948, to get the Hawaiians to stop building in the colonial style and to start making the island look like a 'Hawaiian-themed' destination again. Up to that point, the missionaries had been instructing them to 'modernize' the island and stop living like savages. 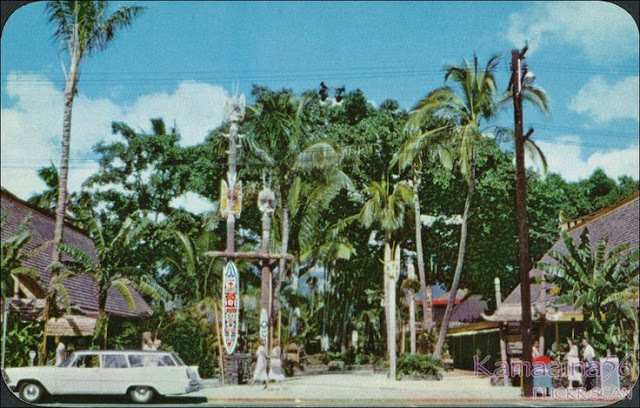 Mick carved the palms and sustained himself on the coconut trees that they were razing to make way for the Market Place. 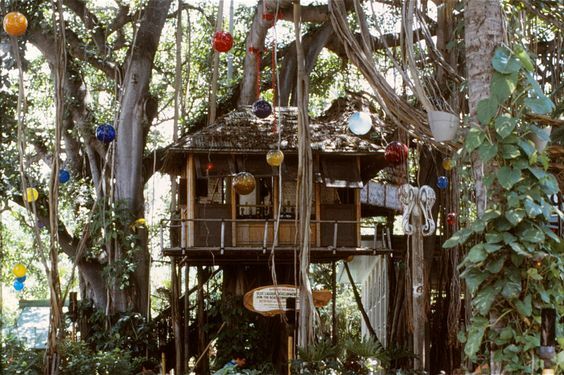 He lived in a shack in the Market Place while he was working on the decor and on the grounds. Don wanted all traces of the modern world gone in this new space... 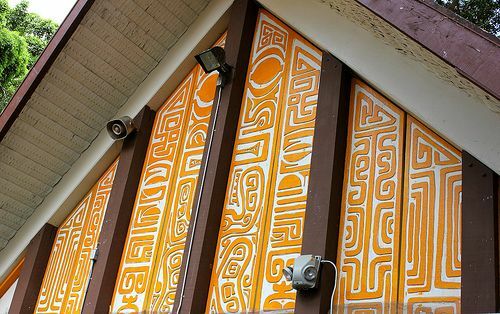 So Mick hid structural and electrical elements with tile mosaics, tapa prints, and bas reliefs with New Guinea and Cook Island motifs. Interestingly enough, the picture below is a horrible example of what I'm talking about. This is a recent(ish) photo. 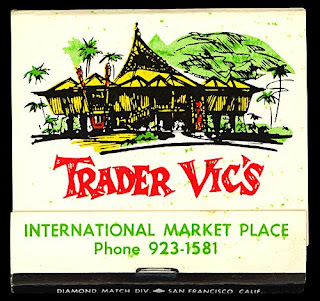 Eventually the Marketplace housed 50 shops, night clubs, and restaurants - including three operated by Don. Don the Beachcomber's Cabaret Restaurant (where Martin Denny and Alfred Apaka regularly performed), The Colonel's Plantation Beefsteak House, and Don's Treehouse. 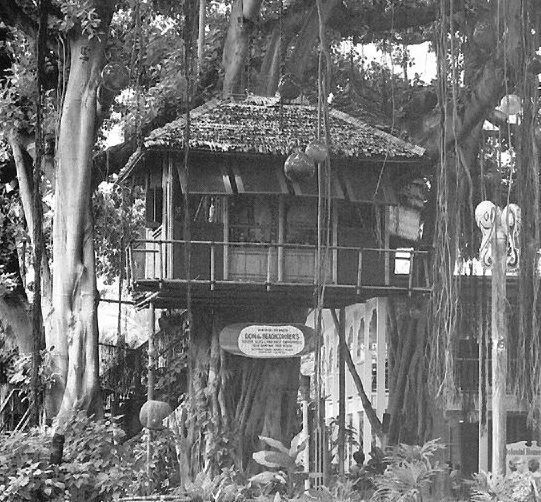 The Treehouse was a bamboo shack built high up in the branches of the Banyon tree. A hand painted sign down below invited you to climb the 'Stairway to the world's most exclusive restaurant, created for those in love with love. Capacity: two." $37.50 bought you roast squab with curried-quail-egg stuffing for two, champagne and scented napkins included. Dinner was already waiting for you when you arrived. You padlocked the door behind yourself and lingered until you felt like leaving. There was a daybed covered with pillows, a record player cued to the song "I Wanna Play House with You," and, should you decide to change into something more comfortable, skimpy native his and hers wraps. The inference was clear: The after dinner entertainment was up to you. 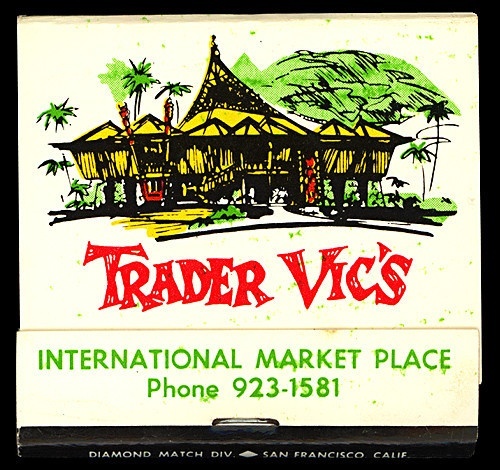 Though Donn and Victor Bergeron (Trader Vic) held a close rivalry, a Trader Vics opened in the Market Place in 1967. And now here's the bummer... 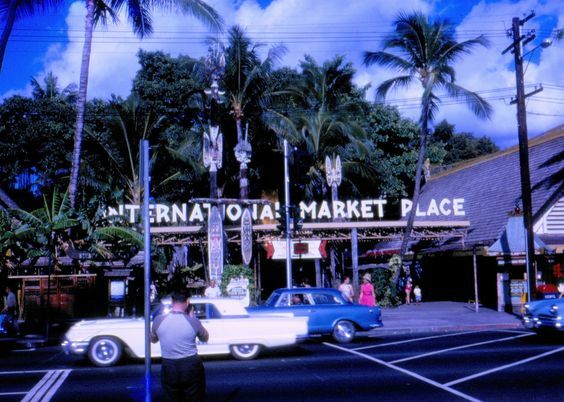 The International Market Place is in the middle of a complete remodel to turn it into a 'luxury shopping experience.' The developers are from Wisconsin or something. 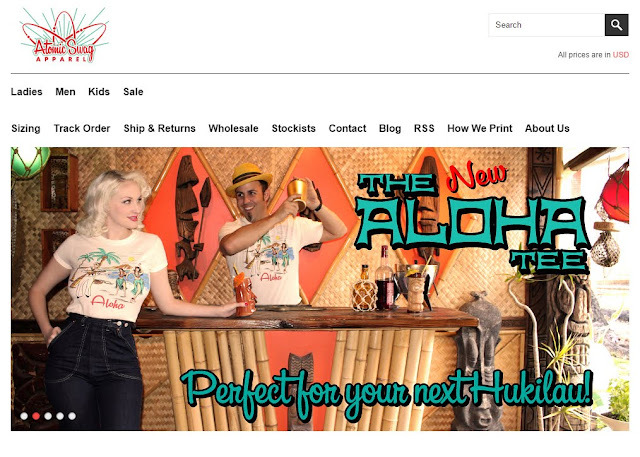 I'd say that it's ironic that another mainlander is turning it into another tourist destination, but it's not. It's just progress and lame shortsightedness in destroying a pop-cultural experience. 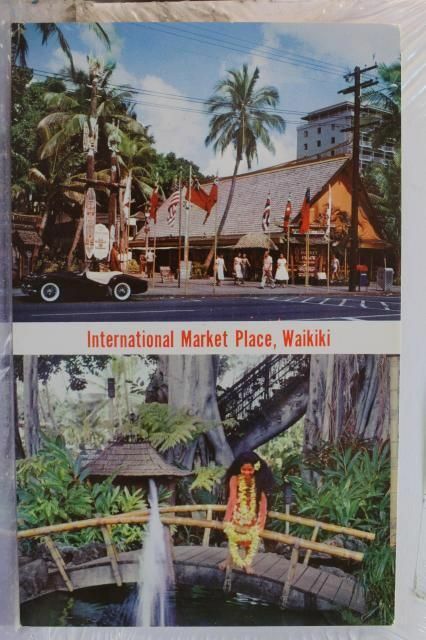 Though, in recent times, the Market Place had turned into a cheap and kinda seedy place to walk through at night, they could have made efforts to re-brand the place as the last true 'Hawaiian' shopping experience. 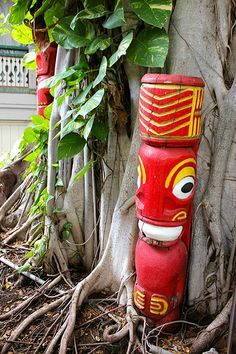 They could have brought in hand crafted cultural arts and Polynesian stage shows again. When I was there, over ten years ago, it consisted of vendors selling mostly all of the same Taiwan-made tourist junk. It felt like a cheap swap meet. It had lost its way. But that's all beyond us now, the only thing that will have any resemblance to the original Market Place will the be Banyon Tree. Once this stuff is gone, they don't ever rebuild it again. 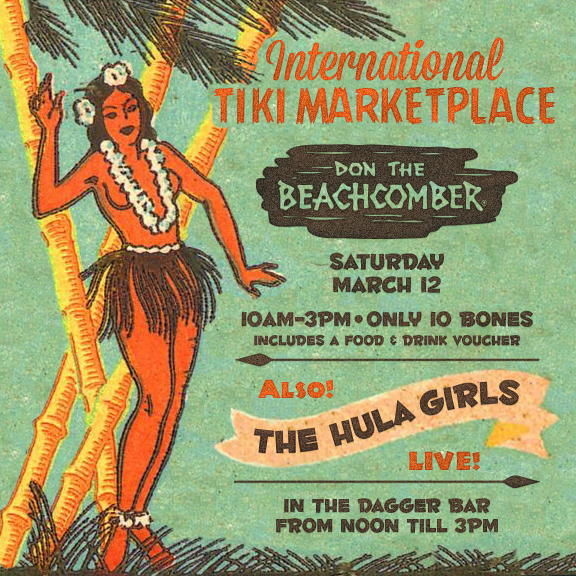 But on Saturday, March 12th, Don the Beachcomber in Sunset Beach will bring back the spirit of the original International Marketplace in Waikiki with their own tiki shopping experience. The Tiki Market Place features over 50 vendors, live Hawaiian music, and the $10 to get you in, also gets you a voucher for food or drink. During this March Tiki Market Place, The Hula Girls have been asked to perform a daytime show in the Dagger Bar from noon till 3pm! It's gonna be a blast. I researched a lot of the information about the Market Place in Beachbum Berry's Sippin Safari book. 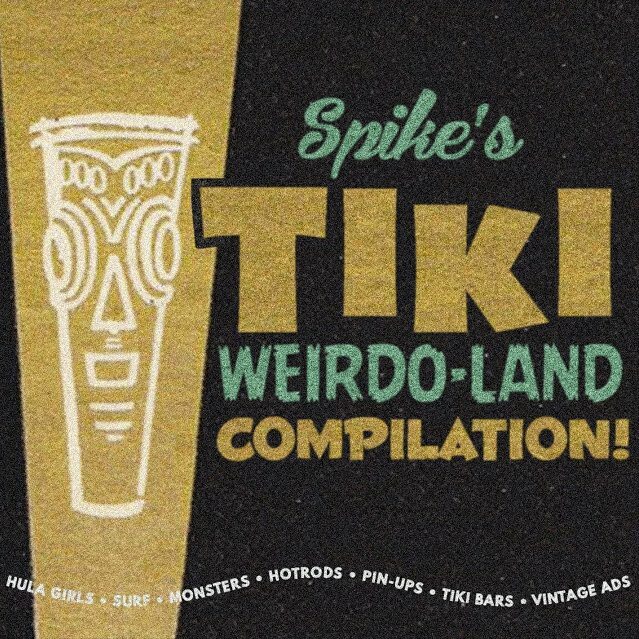 Go get that book for more info on all of the history of tiki drinks, restaurants, bars, and the people behind them. It's really good! 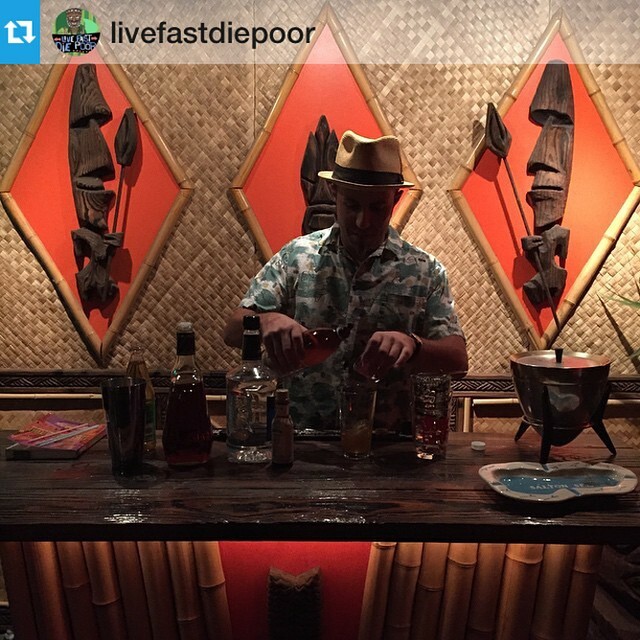 For about four years, I've enjoyed the incredible tiki bar that Bamboo Ben built specifically for The Breezeway (my, (Spike's) home bar). It, along with the iconic orange diamonds, has served as a backdrop to dozens of amazing pinup photoshoots and marketing ads. In a recent conversation with Bamboo Ben, we discussed that a good tiki room is always evolving. The bar and diamonds had their time, but now it's time to move forward. 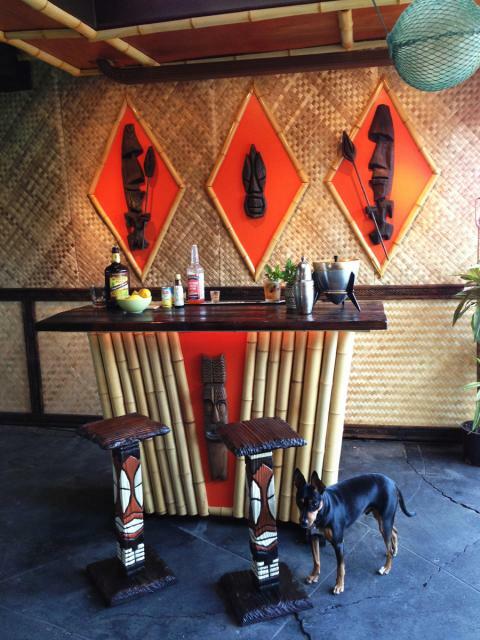 It kills me to do this, but the Breezeway tiki bar is up for sale. 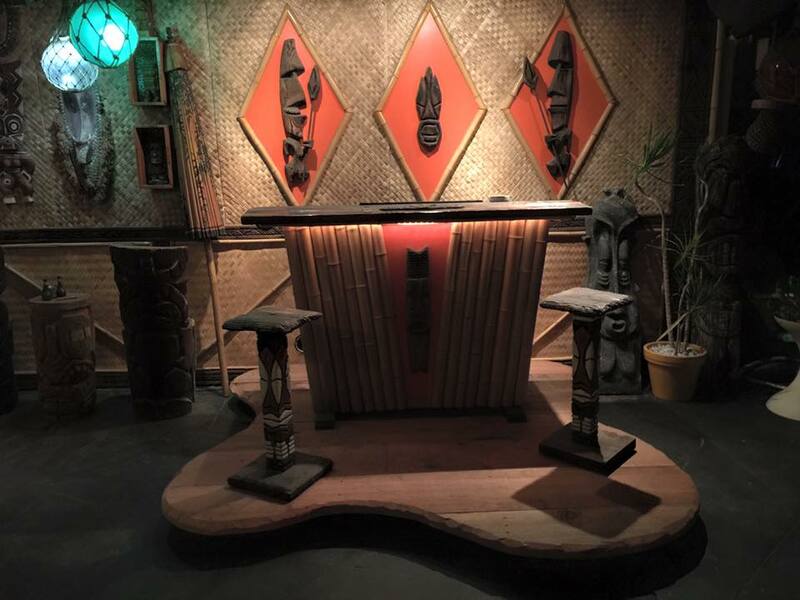 After the giant tiki/ nautical estate sale that I recently landed on, I got so much new stuff that I started working on a new bar in order to evolve the look of The Breezeway. But for now, a look back at some of the good times with this bar. 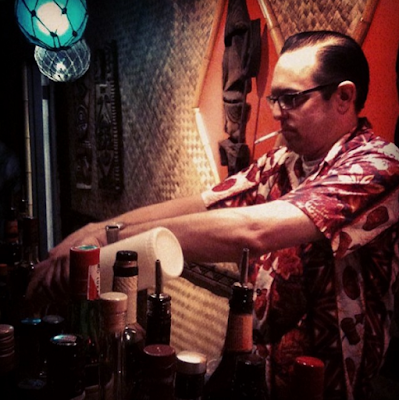 Putting the final touches on, before the first party in the brand new Breezeway Bar. 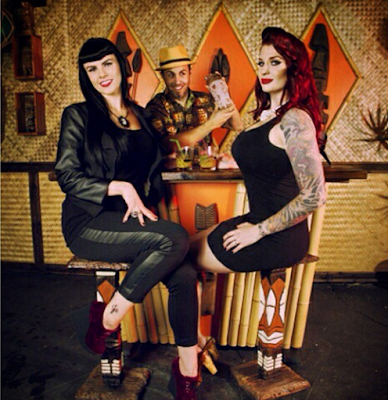 Famed Trader Sam's Bartender, Kelly Merrill with buddy, Iggy. This photo could have been taken in 1963. Kelly, again, during another party. I spent a lot of time, tending bar, during smaller gatherings. Shakin' it up with the gorgeous girls, B DeVille and Red Dodge. She was also a big help in painting and working on building The Breezeway. 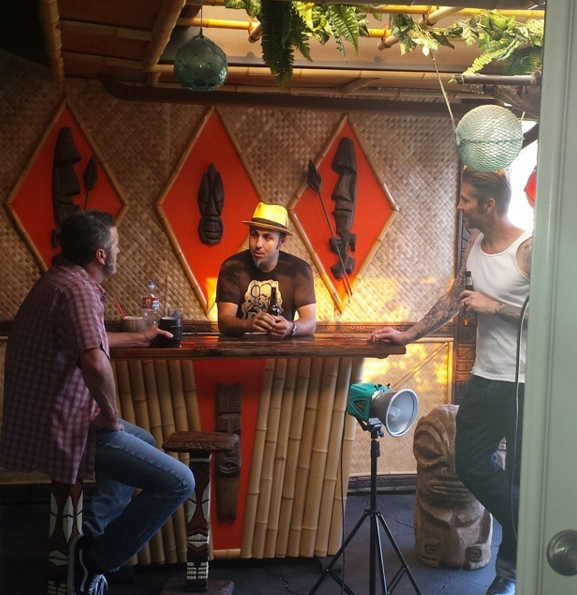 Behind the scenes on the shoot with Red and B. B DeVille was the star of our music video for "Hula Hula, Bang Bang". 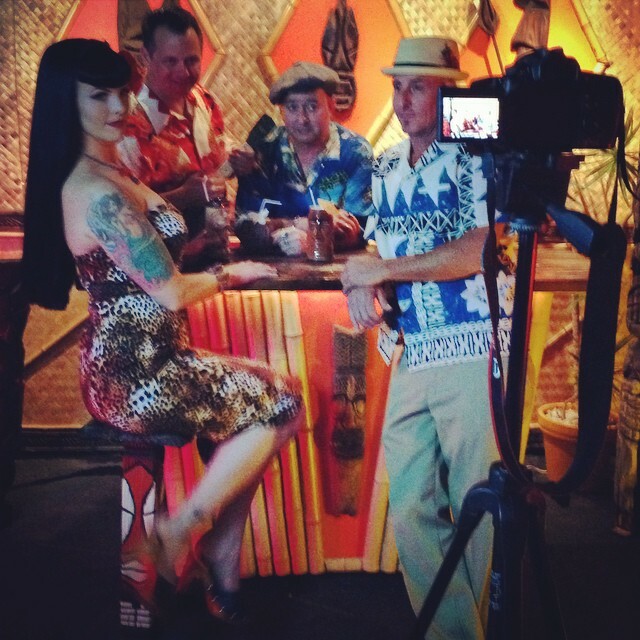 Here she is, with the band, during the shoot. Susana Vestige of Vestige Photography began regularly using The Breezeway for pinup shoots. We collaborated on a 2015 tiki-pinup calendar. I supplied the location and decor and she supplied the photography and the girls. We went through a lot of rum back then. Lots of Painkillers (uh, the cocktail, not pills). I heard something about Miss Kristen Kelly being a reality show star. I never saw her on TV. The guys from the Randomland/ Live Fast Die Poor Podcast came by a couple of nights too. 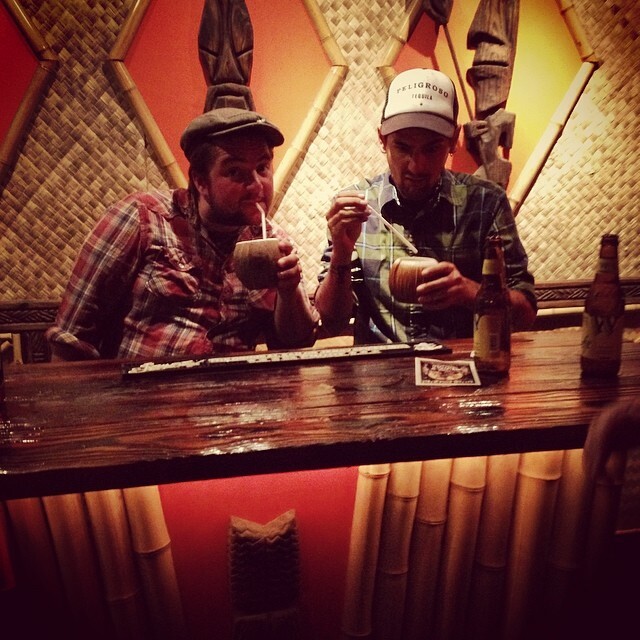 A little later on, drinking Coconauts. They wanted to sit behind the bar. 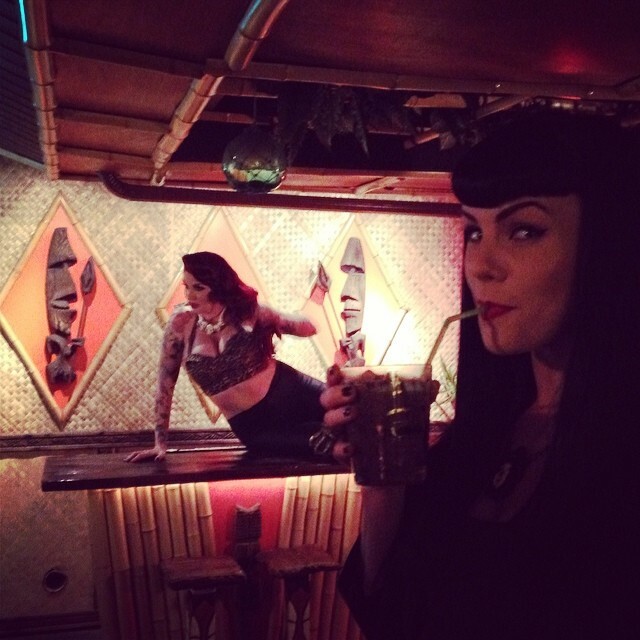 Sadly for the LFDP guys, they weren't still around when Tamara Von Tart was photographed on the bar by Glen McDowell. And the actual photo by the amazing Riley Kern. 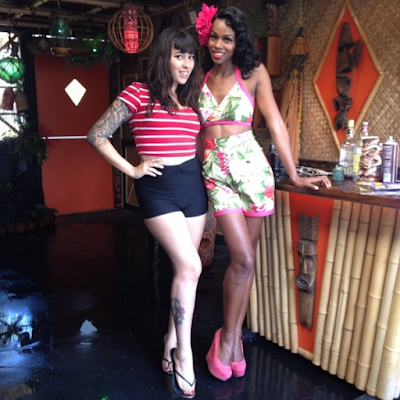 Photographing for a pinups for Vets calendar. 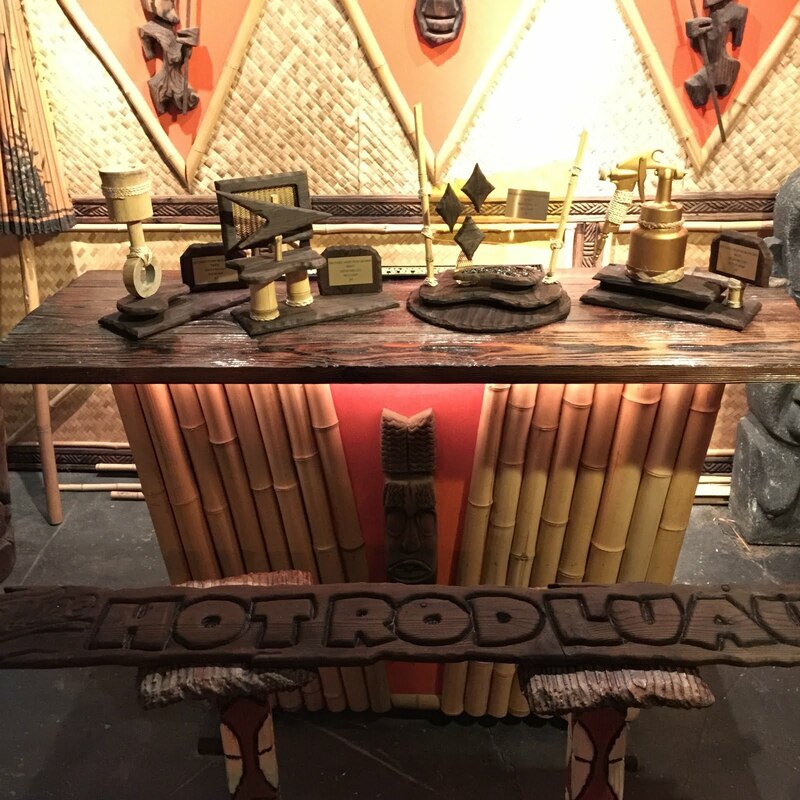 Here's the bar, serving as a trophy stand for all of the Hot Rod Luau trophies that my buddy, Josh, and I created from last year. Our bassist/ steel guitartst/ record producer, Shorty Poole, owns Atomic Swag with his girlfriend. 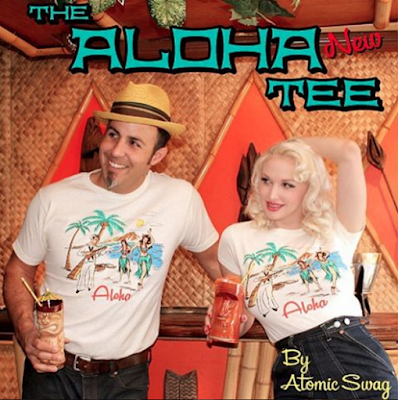 The Breezeway was an obvious choice to shoot his brand new Aloha tees. The look at the Breezeway Bar wouldn't be complete without including photos of my beautiful girlfriend, Miss Ashlyn Coco. So that's that. 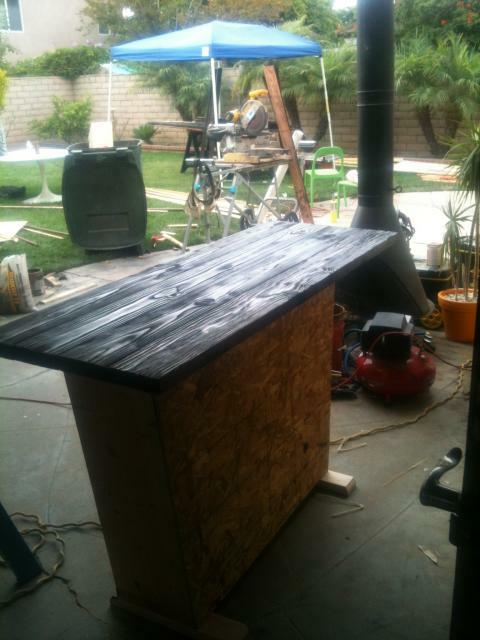 I'm ready to send the bar off to another home, so you can build your own memories with it. 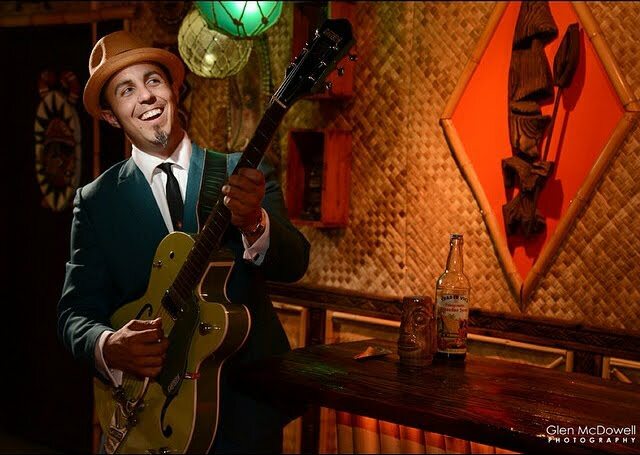 Shoot me an email at info@thehulagirlsmusic.com if you are interested. $500 gets you the bar and the two hand carved stools that I created for it. I will entertain offers as well.